NOTE: This story has been updated. Find the latest updates through the day here. A search and rescue effort was underway Wednesday evening for an airplane that went missing between Port Alsworth and Anchorage with four people aboard. The Piper PA-28 Cherokee left Port Alsworth, 165 miles southwest of Anchorage, around 10:30 a.m., said Alaska Air National Guard Staff Sgt. Edward Eagerton. 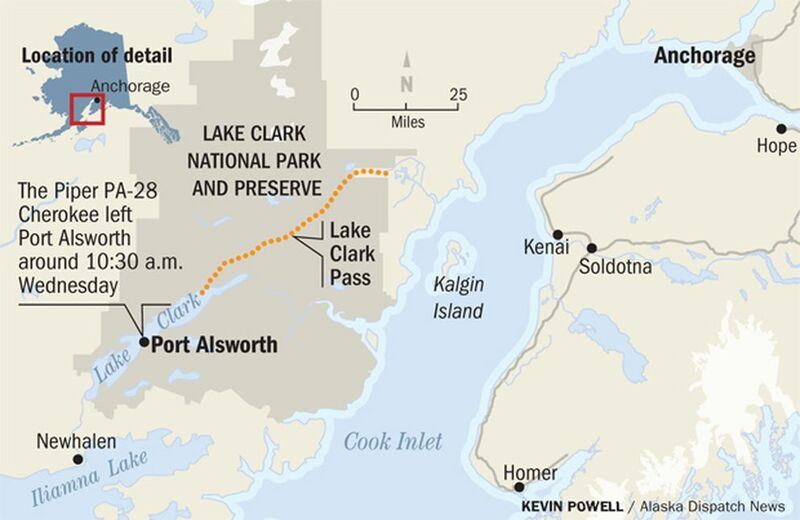 The plane was planning to fly through Lake Clark Pass and was scheduled to land at Anchorage's Merrill Field at noon. Four people were on board the plane, Eagerton said. In an effort led by the Alaska Rescue Coordination Center, members of the Alaska and California air national guards were joining in the search for the aircraft. Members of the California Air National Guard, who were in Anchorage for training, were heading out in an MC-130 aircraft, Eagerton said. A C-130 Hercules from Alaska Air National Guard's 144th Airlift Squadron was also en route, according to Eagerton. An HH-60 Pave Hawk helicopter was on its way from Eielson Air Force Base southeast of Fairbanks to assist in the search Wednesday afternoon, he said. Eagerton didn't know the identities of those on board, or whether the plane was a private or commercial flight.